An Eye Opening , “Power-less” Day. 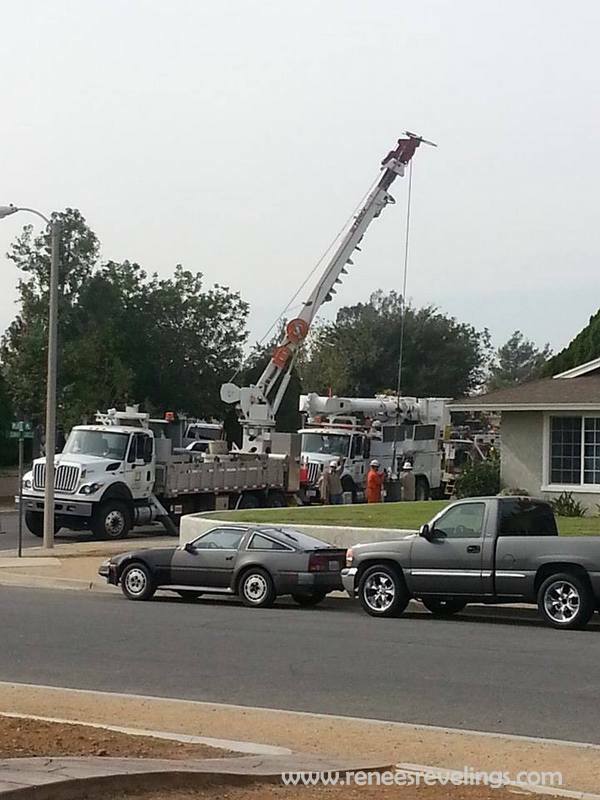 Transformer repair – lots of trucks and equipment. Today is Saturday, October 26. It’s 3 o’clock in the afternoon, and we’ve been a neighborhood with no power since 5 am this morning. It’s not our entire area just our little block of a neighborhood. Weird huh? When I called Southern California Edison to report the outage the customer service rep says, “Are you sure your power is out Ma’am? I’m not showing any outages in your area.” I was the first one to call in. And then she proceeded to ask me if we had checked the breaker box. Ha! I have to admit I was not planning on spending today with no power to the house. It’s somewhat inconvenient, much quieter, and really making me want to take a nap, and I am not a napper by trade. We are hosting a birthday dinner/party tonight for our oldest daughter. My Mom will be handing out flashlights when everyone walks in the door. It will be an adventure!! In light of this change in our Saturday plans I have compiled a list of ten things I have been enjoying or will be enjoying with no power today. What’s that you say, no laundry can be done today? Whoopee , no problem there. Can’t run the dishwasher, that’s ok, we have lots of paper plates in the pantry. No TV during the power outage- that’s fine, I probably watch too many home improvement shows as it is. However, I would like the power to be back on for the World Series game tonight. What? I can’t be on the wireless internet either? That’s fine I probably spend too much time on the computer. No baking or cooking (my stove requires electronic ignition) . Honey, let’s go to Olive Garden for lunch? Yum. Birthday dinner will require paper plates and plastic cups! Easy cleanup! No problem. Watching our two cats interact with one another. They have this love-hate relationship going on. The older cat is always growling and hissing at the younger guy. Even when he is doing absolutely nothing. I’m noticing that having a technology free day is not a bad thing! Maybe I should do this once a week. Maybe The Party House needs to “disable” the wi-fi for family gatherings. Hmmm?? What would the twenty-something crowd do with themselves?? Having Travel Man home today to start-up the generator -priceless. He loves going into “survival” mode. It’s a guy thing. An interesting side note to this day- the power did not get turned back on until 9 pm on Saturday night. We strung a few lights in the house via my Mom’s RV generator for the birthday dinner. The conversation was great, not a lot of cell phone surfing going on. Oh, and my kind brother and Travel Man hooked up the TV so we could see the last few innings of the World Series game. My family is so great. Happy Monday everyone!